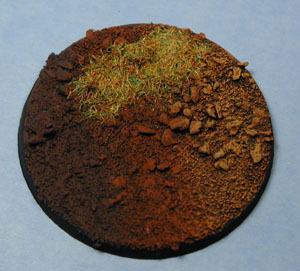 I find I'm constantly asked, how I do the ground work on my painted figures and terrain pieces. So instead of answering the question over and over, I have decided to try and explain it as simple as I can in a step by step tutorial here on my web page. My goal is to provide some valuable information to everyone from the beginner to the experienced modeler. 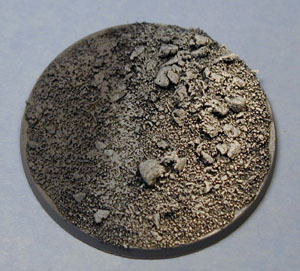 materials available in most hobby and model shops. in. 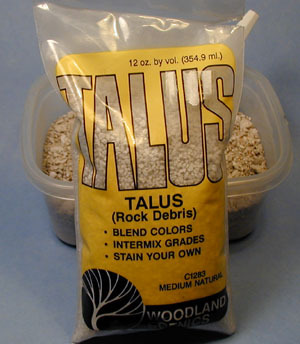 This is a product called Talus made by Woodland Scenics. 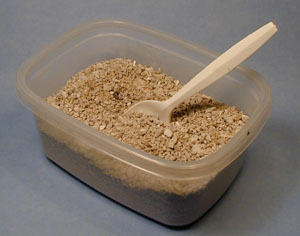 is my tub of mixed ballast. 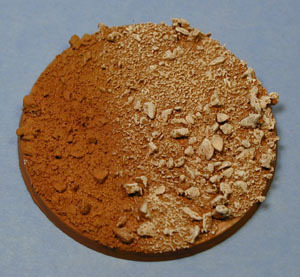 CA glues because of the speed at which it dries plus its strength. work looks "Out of Scale". You ask, what do I mean by out of scale? Well we spend hours painting a miniature figure to give the illusion of reality. the base work is applied unpainted, I feel it looks "Unnatural"
or "Out of Scale" So if we paint or finish it, it looks more natural. base work primed white and black. 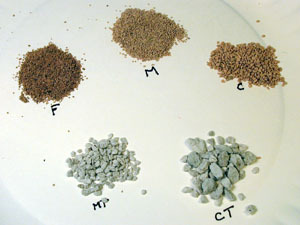 Below are some examples of painted base work. 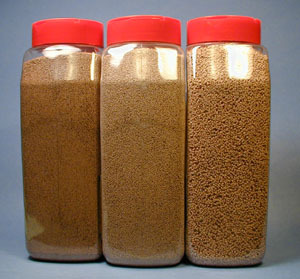 They are a basic brown earth tones , a desert sand and a "Ash" waste land. As to exact colors used to paint them that's not all that important because there are so many different ranges of paint used to paint miniatures these days. But the basic concept is to start dry brushing with a dark shade of your chosen earth tone, followed by a medium and then lighter shades of paint. Its up to you as to how far you wish to take this. One image shows a small amount of static grass added to it..